William Kilgore Brown (Willie) was born in Coffeyville, Kansas in early July 1894. 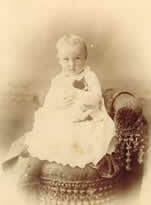 He died in October 1898 at the age of four from pneumonia. He never lived in the mansion. He is buried in Elmwood Cementary in Coffeyville, Kansas.